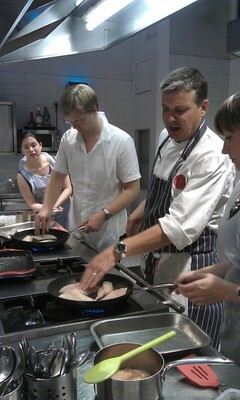 Steve Field, the chef from New Zealand teaches us how to shake the searingly hot pan to create a wall of flames. We 'Ooooh' and 'Ahhh' and give it a go ourselves. "Sometimes it helps to do these 'chef-y' things" he tells us with a cheeky smile in his calming New Zealand accent. 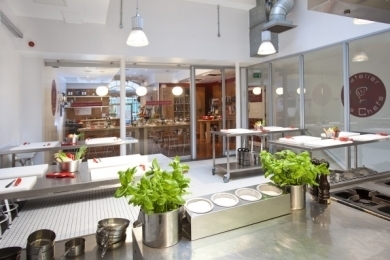 L'atelier des Chefs has cooking schools in Oxford Circus and St Paul's and runs classes from 'Cook, eat and run' (30 mins and £15 a head) to corporate events. 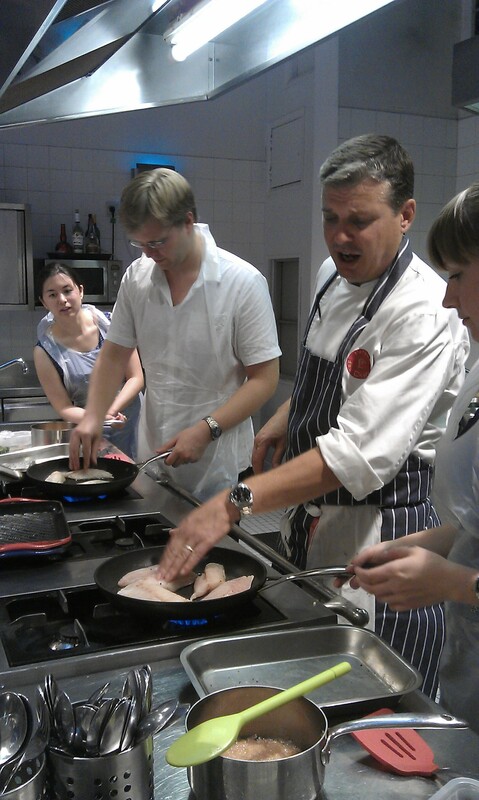 I was at 'Cook and dine: French classics' (1 hr 30 mins and £54 a head). The entrance to L'atelier des Chefs is calming and modern and the walls are lined with Le Creuset, recipe books and a smiley, welcoming receptionist. We are given a glass of wine and given a seat to wait and take in the surroundings. Sleek wood and cream walls give a clean feel and the music choice is recent and inoffensive creating a relaxing mood. We are taken into one of the two spacious and immaculate kitchens and given the menu by our chef for the evening, Steve Field. Steve is patient and friendly, teaching us tricks and explaining the best type of ingredients, when it's ok to take short cuts (and when it isn't) and watches and helps where necessary. After each course we went as a group back out to the seating area and sampled our creations. We all agreed it was delicious and hard to believe we made it ourselves. Learn how to make a classic French béarnaise sauce and enjoy it with a perfectly cooked rump steak and a handful of fresh rocket leaves. A great selection of food, deliciously cooked (under Steve's instruction) and a fun, wholesome evening versatile enough to be spent with family or colleagues.